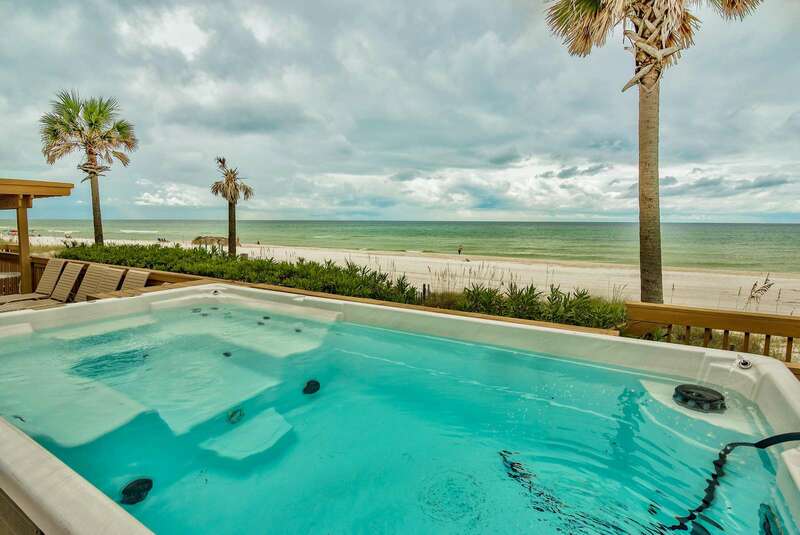 Sea's The Day is an exceptional home...located directly across from a private dedicated beach is one of the most high-end beach homes you'll find for rent in Panama City Beach. For the very discerning guest, and adorned with luxurious elegance, the furnishings and upgrades rival what you'd find in the nicest 5-star resorts in the most exotic locations. Sea's The Day has everything your family will need to make your vacation a GREAT vacation. Just bring yourselves and some sunscreen, because you will need it! This beautiful 3 bedroom 3 bath home sits directly on the sugary, white, sandy beaches of Panama City Beach. ZERO steps to the Beach - You are already there! Across from Dusty's Oyster Bar! Home is approximately1600 square feet with great views of the GULF and flat screens in the greatroom and all 3 bedrooms. 4809 Spyglass Drive is our Panorama house. Prices quoted here are for the DOWNSTAIRS portion of the home. It can be booked in conjunction with the upstairs. It is a great octagon shaped house located directly on the beach with a great wrap around deck. It is a 2 bedroom and 2 bath that will sleep a Max of 6. It is a two story house and each floor has a full kitchen and washer/dryer. The bedding for the house is 1 king size beds and 2 twin size beds. This house is a great place to spend your vacations on Panama City Beach. It is very private and beautifully decorated. The owner is meticulous about the unit, so you will love every inch of the house. It rents quickly so book it today. Home is located on Spyglass Drive (West end of Thomas Drive area). Very close to Captain Jack's Crab Leg Buffet, Schooner's, Montego Bay, Scampi's, and many other restaurants. Home is also just a short 3 minute drive to St. Andrews Bay and the world famous Captain Anderson's Restaurant, The Boat Yard, and much more. House is absolutely beautiful. Panorama is a great octagon shaped house located directly on the beach with 2 great wrap around decks. The rate that is quoted is for the UPSTAIRS part of the house, but it can be booked with the lower unit as well. From the top deck you can see all the way to the end of the beach. We don't rent daily. It is a 2 bedroom/2 bath that will sleep 4. There is a kitchen and washer/dryer on each floor. The bedding for the house is 1 king size bed and 2 twin size beds. 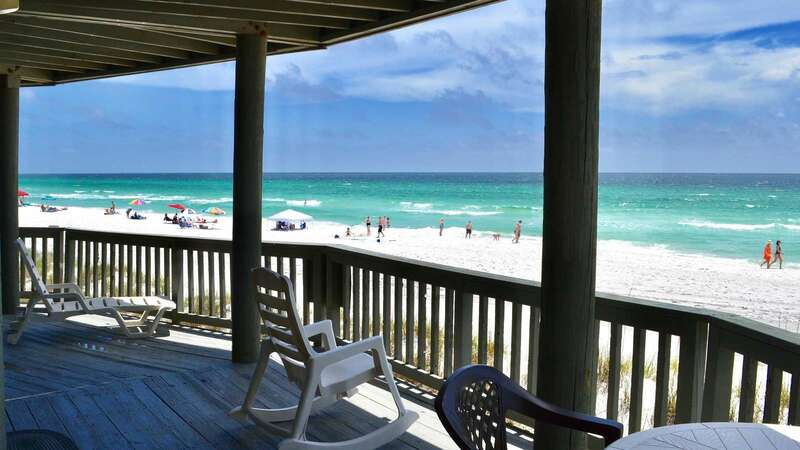 This house is a great place to spend your vacations on Panama City Beach. It is very private and nicely decorated. No grilling allowed on the decks. Your family wiil make wonderful memories at this beach house. It rents quickly so book it today. Home is located on Spyglass Drive (West end of Thomas Drive area). Walk across the street to Captain Jack's Crab Leg Buffet or drive just 3 minutes to Schooner's, Montego Bay, Scampi's, and many other restaurants. Home is also just a short 5 minute drive to St. Andrews Bay and the world famous Captain Anderson's Restaurant, The Boat Yard, The Treasure Ship, and much more. House is absolutely beautiful. 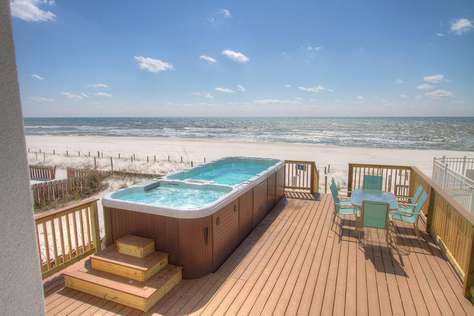 Lochloosa is a BRAND NEW, beautifully finished Florida Cottage style beach house with a private Hot Tub. This home is 100% New in every way! It is located on the East end of Panama City Beach on Gulf Drive about 100 yards East of Schooners Restaurant! The three spacious bedrooms are located on the first and second floors. The master bedroom is located on the second floor and has a King Bed. Also on the second level is the bunk room that boasts 2 Queen over Queen Bunk Beds! This room sleeps 8. The first level bedroom is equipped with a Queen Bed. There is also a pull-out sleeper sofa in the Living Room. The kitchen is well equipped with custom cabinets, granite counter tops, premium appliances, and all the essentials for lovingly preparing meals for the family. The hardwood floors and decorations make you feel like you're in the comfort of your own home. This is a great home for one large family or two smaller families that care to share the cost of a beach rental. One king room, 1 queen room, 2 sets of bunks. This home will bring your Family memories that will last a lifetime. Easy Access: Thomas Drive has the best traffic flow in the area. During the busiest times of spring break and peak summer weeks, Front Beach Road experiences bumper to bumper traffic. From Thomas Drive you can drive anywhere in minutes without the hassle of traffic. Shopping Nearby: There are 2 major grocery stores and a Super Walmart within 2 miles. Pier Park is an ideal place for shopping and is only a 10 to 15 minute drive from the house. At Pier Park you will find several major department stores, many outlet stores, specialty stores, unique apparel and jewelry stores, fun activities for the kids, a major 16 theater cinema, and some of the best restaurants in the area. Fun Activities: Shipwreck Island water park is blast for the whole family in the heat of the summer. Within a very short distance of the house there are several venues for miniature golf, bumper boats, sling shot bungee rides, a Ripley's Believe it or Not, and all the beach activities one could ask for. For the golfing enthusiasts, there are 5 public courses within minutes of the house. Signal Hill is just a mile down the road. Holiday Club is about a 12 minute drive and is a little more challenging. For the best golfers, Bay Point, with its 2 courses is about a 10 minute drive, and The Hombre is less than a 10 minute drive. Lochloosa is located in the heart of all your favorite beach activities. 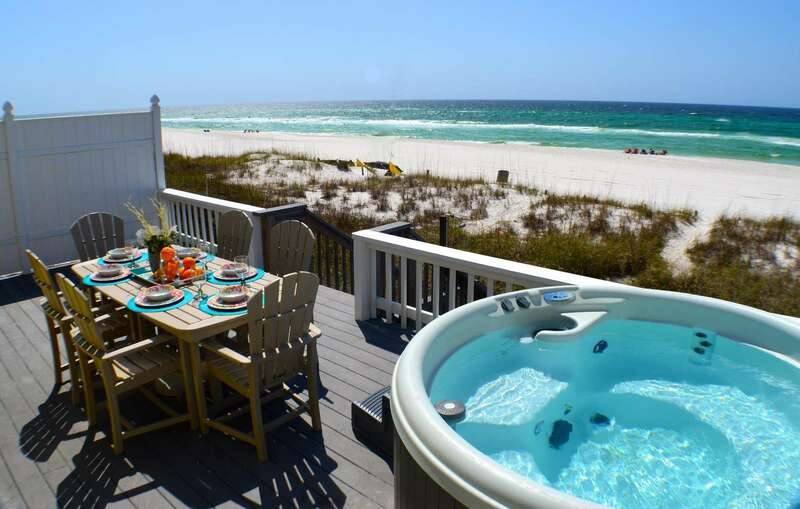 This Villa is one of the best Beachfront rentals in PCB. Over 3000 sq. ft elegant Mediterranean style villa with fabulous ocean views throughout; 3 balconies; built in 2002 with all new decor 2012 beautiful and classy furnishings, including flat screen TV's in every bedroom and a 60' screen in living area; large gulf front deck (this is critical to most renters) with grill, amazingly close to the ocean; 3 King Beds & 4 Queens, jacuzzi tub in master, computer desk with wifi, privacy garage. Cotton Sails is also located on a somewhat secluded street off Thomas Drive, which leads to less congestion on the beach, and still close to many restaurants, grocery stores, wall mart, home depot, lowes, seafood markets etc. Home is approximately 2400 square feet with great views of the GULF from almost every room and flat screens in the greatroom and all 4 bedrooms. Upstairs master suite enjoys awesome Gulf views. Newly Listed Beachfront Home! Sleeps 12 in beds!!! Casa Isabella - Wonderful Beachfront Home with 3 bedrooms 2 bath home that sits directly on the sugary white sand beaches of Panama City Beach. ZERO steps to the Beach. Casa Isabella is approximately 2000 square feet with fantastic views of the Gulf. Home has a large open area for entertaining and a gourmet kitchen.The house also boasts plenty of outdoor space (covered and uncovered) over-looking the beautiful beach and Gulf of Mexico. Casa Isabella is perfect for enjoying the sound of the waves or cooling off in the Ocean! Excellent layout for large groups! Kitchen is fully furnished with everything you will need. Come make memories and enjoy this wonderful home with your family and friends. Home is located on West end of Thomas Drive in the middle of Panama City Beach.The home's location couldn't be better; you're within walking distance to several restaurants, night spots and a short bike ride to St Andrews State Park. Whether you're watching the sunbathers or the sunsets, you can't beat this wondeful home to help make memories of a lifetime! This Brand New Private Beachfront Home boasts a heated 14x24 Beachfront Pool & Hot Tub (Pool can be Heated for additional $275/week)! Location, Location, Location! Sleeps 26 in beds!!! Making Waves is a beautiful 9 bedroom 8.5 bath home that sits directly on the sugary white sand beaches of Panama City Beach. ZERO steps to the Beach - You are already there! Home is approximately 4300 square feet with almost every room having a wonderful view of the emerald water. Home has a Large open area for entertaining and Gourmet Kitchen. There is also a separate Media/Game room for the kids upstairs with game table and large flat screen TV. With over 2000 sq. feet of outside decking (with 480 sq feet protected from Sun/Rain), Making Waves is perfect for enjoying the sound of the waves or cooling off in the Pool! Excellent layout for large groups! Kitchen is fully furnished with everything you will need. Large kitchen table seats 10 + 8 more at the standard height kitchen bar (plenty of outside dining as well - 15 more!). Home also boasts plenty of parking for boats, motorcycles, or RV's. Come make memories and enjoy this wonderful home with your family. We have other homes very close by for your Large Groups. Home is located on Gulf Drive (West end of Thomas Drive area). Walking distance to Schooners Beach restaurant and Very close to Captain Jack's Crab Leg Buffet or drive just 3 minutes to Captain Andersons or Boat Yard and many other restaurants. House is absolutely beautiful and no other home in the area compares!!! Newly Listed Beach House! Location, Location, Location! Sleeps 14 in Beds!!! "30A Beach Happy" is a 5 Bedroom house located directly across from beach access for exceptionally easy access to the beach. 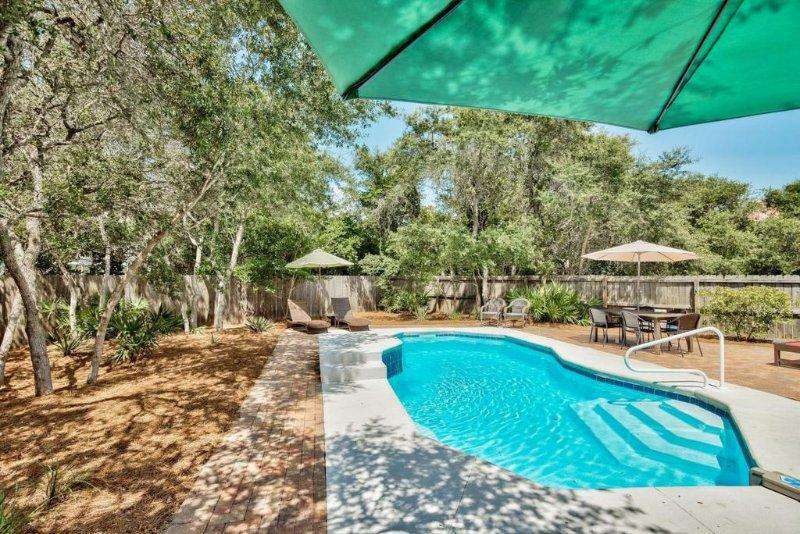 Memories on 30A is a 1st tier home on 30A with your very own Private, Heated Pool. Your beach house is 1.5 Miles from center of Aly's Beach a 5-7 minute bike ride over to Aly's beach, The 30A bike path is in front of "Memories on 30A". 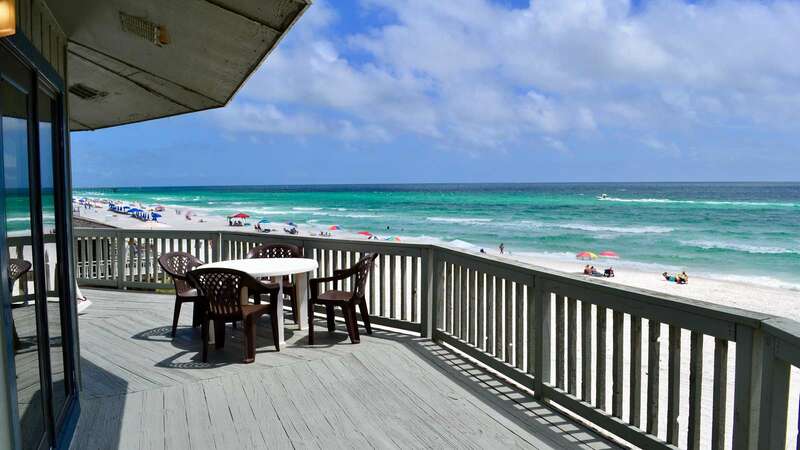 Rosemary Beach is located 2 miles from the beach house and a nice 10-12 minute bike ride. There are no high density developments near by "30A Beach Happy". Located less than half a mile to the west is Camp Creek Lake which is a rare coastal dune lake on which Watersound is located, Great for Kayaking and Paddle boarding. Perfect location and uncrowded beaches for a relaxing vacation close to it all..
Come make Memories of a Lifetime! You will LOVE this Home! Incredible Beachfront Home Available! 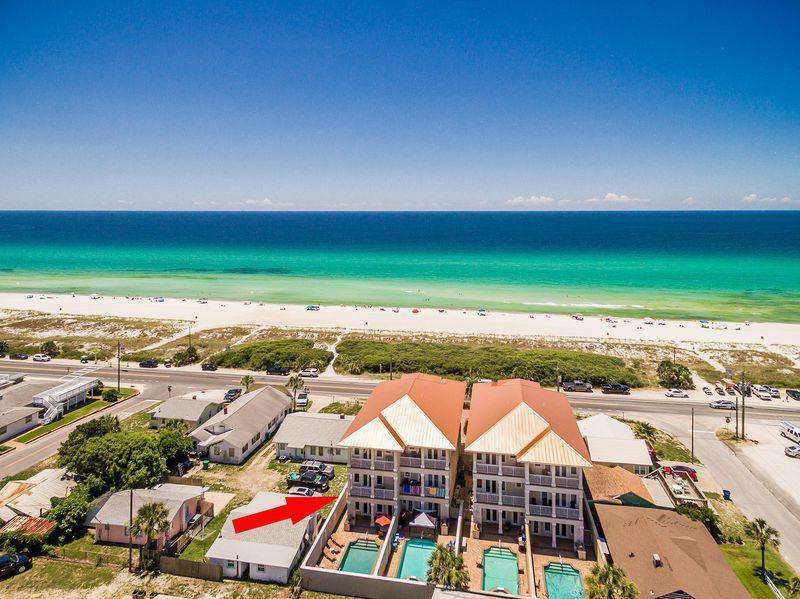 Incredible Home Directly in the middle of PCB steps away from the Sugar Sands of PCB! Total of 6 Bedrooms and 4.5 Bathrooms! Consists of Two Homes. A Cottage and a House. The Seahorse has a total of 6 large Bedrooms and 4.5 large Bathrooms. You will also enjoy 2 Master Suites and 2 Kitchens. The Seahorse also boasts 2 Great Rooms – one for the kids, and one for the adults. The Seahorse is great for large groups! Enjoy the Views with your supersized beachfront patio with private Hot Tub and Tiki Bar while relaxing and visiting with friends & Family or Enjoy Incredible sunsets on your private rooftop sundeck for 6. Plenty of parking which includes a pickup for an RV. This home is located in the middle of Panama City Beach and is close to all area attractions - just a half-mile east of very popular Pier Park! Home is also perfect for small children or pets – home is on a private side street just off the main road. We hope you choose The Seahorse! Newly Listed Beachfront Home! Sleeps 11 in beds!!! Sandcastle- Wonderful Beachfront condo with 3 bedrooms / 3 bath condo that sits directly on the sugary white sand beaches of Panama City Beach. ZERO steps to the Beach. 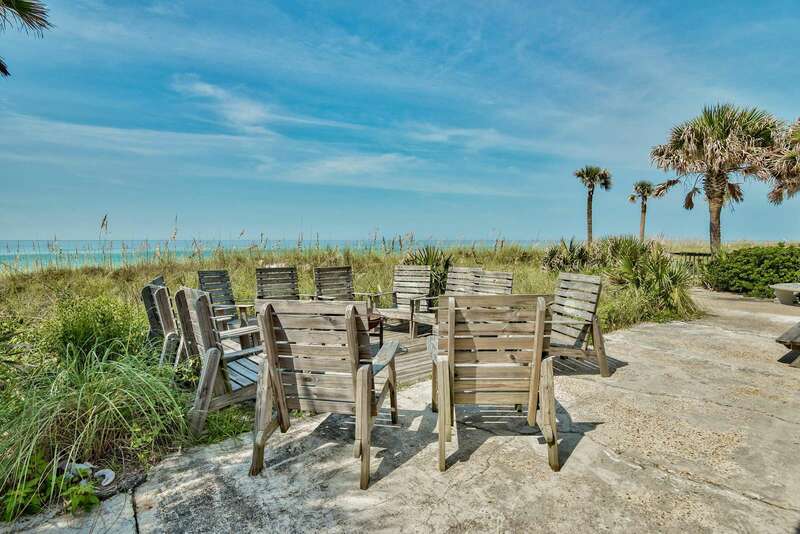 Sandcastle is approximately 1800 square feet with fantastic views of the Gulf. Home has a large open area for entertaining and a well appointed kitchen. 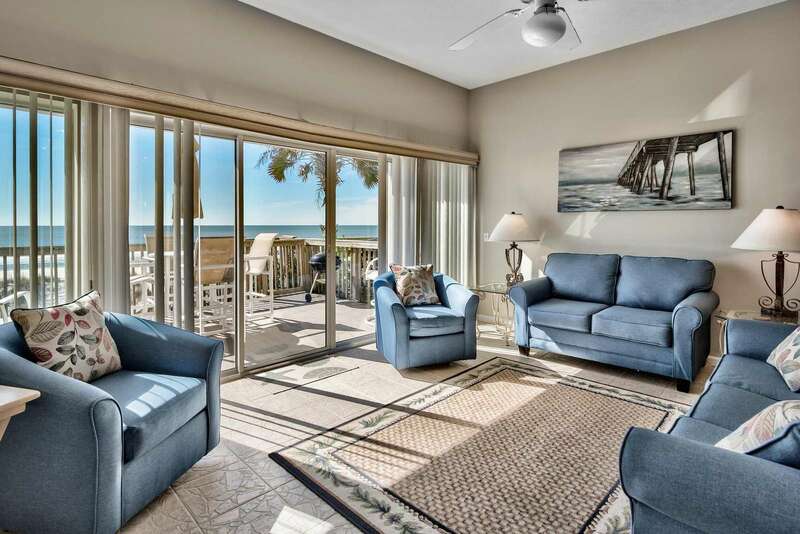 The condo also boasts plenty of outdoor space (covered) over-looking the beautiful beach and Gulf of Mexico. Sandcastle is perfect for enjoying the sound of the waves or cooling off in the Ocean! Excellent layout for large groups! Kitchen is fully furnished with everything you will need. Come make memories and enjoy this wonderful home with your family and friends. Newly Listed Beachfront Home! Sleeps 10 in beds!!! Island Time - Wonderful Beachfront Home with 3 bedrooms 2 bath home that sits directly on the sugary white sand beaches of Panama City Beach. ZERO steps to the Beach - You are already there! Island Time is approximately 2000 square feet with fantastic views of the Emerald water. Home has a large open area for entertaining and a gourmet kitchen. The house also boasts plenty of outdoor space (covered and uncovered) over-looking the beautiful beach and Gulf of Mexico. Island Time is perfect for enjoying the sound of the waves or cooling off in the Ocean! Excellent layout for large groups! Kitchen is fully furnished with everything you will need. Come make memories and enjoy this wonderful home with your family and friends. Home is located on Spyglass Drive on the East end of Panama City Beach.The home's location couldn't be better; you're walking distance to several restaurants, night spots and a short bike ride to St Andrews State Park. Whether you're watching the sunbathers or the sunsets, you can't beat this view! Life's a Beach has plenty of space. This 3000 square foot, 4 bedroom, 3 bath home is located directly on the beautiful beaches of Panama City Beach. Come enjoy stunning views of the Gulf and picture perfect sunsets. Life's a Beach has plenty of space and boasts 2 huge Living Rooms - one for the kids and one beachfront for the adults! Life's a Beach has a beautiful kitchen with an enormous kitchen island for your family dinners and entertaining. The open floor plan extends from the kitchen into a grand room. The grand room has a table that easily seats 8 for dining and many more at the kitchen island. The sitting area has comfortable furnishings for either enjoying the breathtaking views or just laying back and watching some TV. 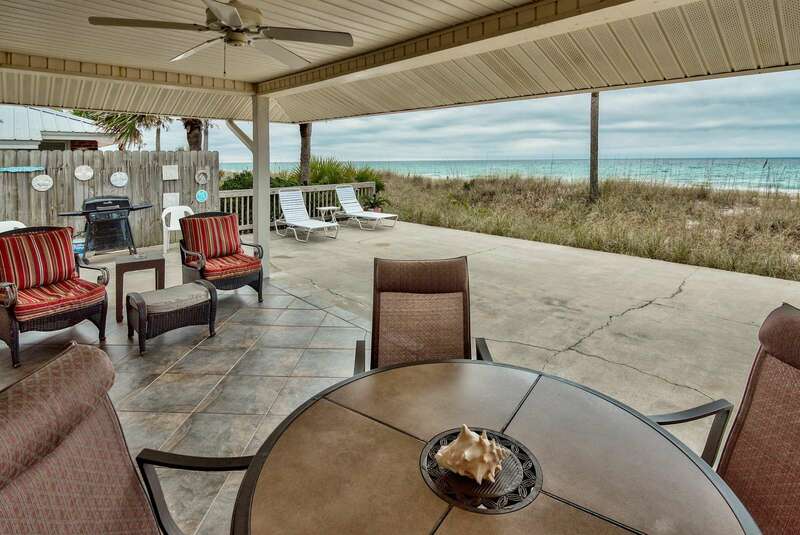 Home is approximately 2100 square feet with great views of the GULF. Home also boasts 2 master suites (1 Upstairs and 1 Downstairs) and a huge great room with plenty of space to make family memories, Upstairs master suite enjoys its own private balcony - also with awesome Gulf views. Enjoy sunsets from the spacious deck with outdoor luxury furniture! Excellent layout for large groups! Kitchen is fully furnished with everything you will need. Come make memories and enjoy this wonderful home with your family or large group. The relaxed life at the beach awaits! Home is located on the quiet East end of Pabama City Beach just down the street from the popular Schooners Restaurant and Bar. House is absolutely beautiful. Call now to reserve your memory making vacation! Fabulous Beach House! Location, Location, Location! Sleeps 21 in beds!!! 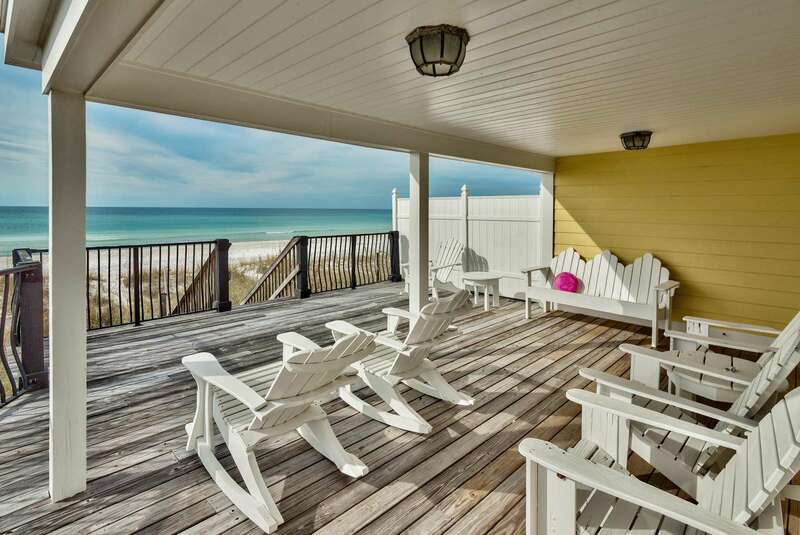 The Golden Beach House (East) is a beautiful 5 bedroom 3.5 bath home that sits directly on the sugary white sand beaches of Panama City Beach. ZERO steps to the Beach - You are already there! Home is approximately 2900 square feet with 5 bedrooms having awesome gulf views. Home has 2 huge great rooms (one with a 7 ft. air hockey, and 10. ft shuffleboard table & FoosBall Table). 2 Bedroom Upstairs suite enjoys its own private 20 X 30 ft balcony. Enjoy sunsets from your 67 X 20 ft deck with new private 14' Beachfront SwimSpa. Excellent layout for large groups! Kitchen is fully furnished with everything you will need. Large kitchen table seats 8 for your large groups to dine. This beautiful home has been recently renovated. Home also boasts parking for boats, motorcycles (up to 10 cars). Come make memories and enjoy this wonderful home with your family. The relaxed life at the beach awaits! Home is located just east of Regency Towers and just west of Schooner's Beach Bar and Restaurant. Not even a 3 minute walk to Schooner's, Scampi's, and many other restaurants. Home is also just a short 4 minute drive to St. Andrews Bay and the world famous Captain Anderson's Restaurant and much more. House is absolutely beautiful !!! 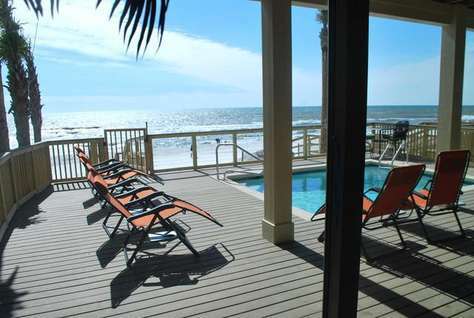 Beachfront Home with HEATED Private Beachfront Pool (Heated for additional $275/week)! Location, Location, Location! Sleeps 20 in beds!!! The Tourist Trap is a beautiful 5 bedroom (+ Additional sleeping Loft area) 4.5 bath home that sits directly on the sugary white sand beaches of Panama City Beach. ZERO steps to the Beach - You are already there! Home is approximately 2900 square feet with almost every room having a wonderful view of the Emerald water. Home has a Large open area for entertaining and gourmet kitchen. There is also a separate Media/Game room for the kids upstairs with game tables and large flat screen. With over 1800 sq. feet of outside decking (with 450 sq feet protected from Sun/Rain), the Tourist Trap is perfect for enjoying the sound of the waves or cooling off in the Pool! Excellent layout for large groups! Kitchen is fully furnished with everything you will need. Large kitchen table seats 8-10 + 4 more at the standard height kitchen bar (plenty of outside dining as well - 15 more!). Home also boasts plenty of parking for boats, motorcycles, or RV's. Come make memories and enjoy this wonderful home with your family. For your LARGE groups you can also rent 2 more homes next door - they have Private Pools also! Home is located on Surf Drive (West end of Thomas Drive area). Walk across the street to Captain Jack's Crab Leg Buffet or drive just 3 minutes to Schooner's, Montego Bay, Scampi's, and many other restaurants. Home is also just a short 5 minute drive to St. Andrews Bay and the world famous Captain Anderson's Restaurant, The Boat Yard, The Treasure Ship, and much more. House is NEW and Absolutely Beautiful. Wonderful Beachfront Home with Private HEATED Beachfront Pool & Huge Hot Tub (Pool can be heated for an additional $275/week)! With over 1800 sq. feet of outside decking (with 450 sq feet protected from Sun/Rain), the Holiday Fin is perfect for enjoying the sound of the waves or cooling off in the Pool! Excellent layout for large groups! Kitchen is fully furnished with everything you will need. Large kitchen table seats 10 + 4 more at the standard height kitchen bar (plenty of outside dining as well - 15 more!). Home is located on Surf Drive (West end of Thomas Drive area). Walk across the street to Captain Jack's Crab Leg Buffet or drive just 3 minutes to Schooner's, Montego Bay, Scampi's, and many other restaurants. Home is also just a short 5 minute drive to St. Andrews Bay and the world famous Captain Anderson's Restaurant, The Boat Yard, The Treasure Ship, and much more. House is absolutely beautiful. 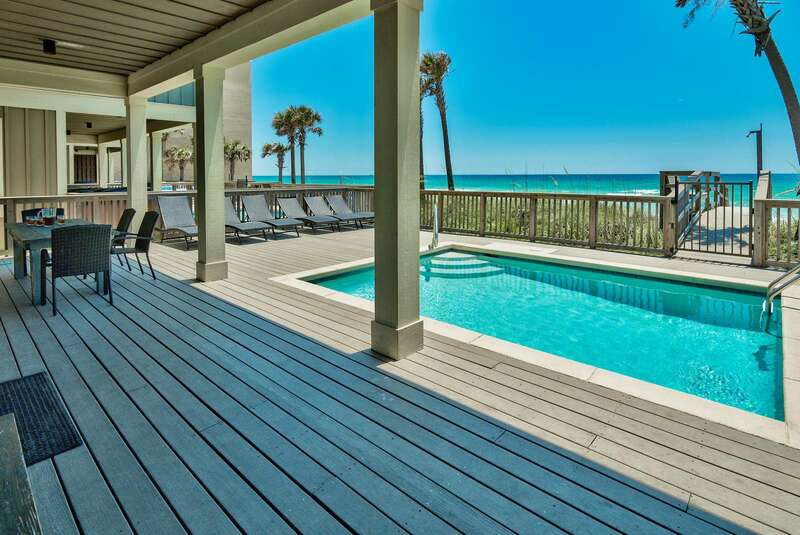 Surf Song is an Incredible Beachfront Villa that sits directly on the sugary sand of Panama City Beach. 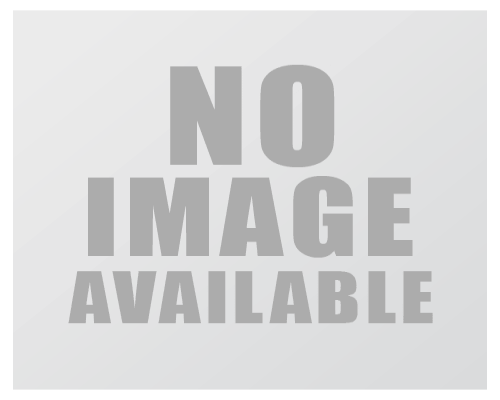 Home is approximately 3000 square feet with 5 bedrooms and 5 bathrooms. All 3 levels of the home have beachfront balconies with awesome views. Sleeps 20! Enjoy sun-bathing or relax in the fabulous SWIM-SPA from your 500 ft2 deck. SWIM-SPA is both a hot tub and a small swimming pool to cool off - you get the Best of both Worlds!!! Excellent layout for large groups! Kitchen is fully furnished with everything you will need. Large kitchen table seats 8 for your large groups to dine. Home also boasts garage parking. Come make memories and enjoy this wonderful home with your family. The relaxed life at the beach awaits! Home is located just east of The Summit and very close to many restaurants: Schooner's Beach Bar and Restaurant, Montego Bay, Scampi's, Captain Jack's Seafood Buffet and many other restaurants. Home is also just a short 5 minute drive to St. Andrews Bay and the world famous Captain Anderson's Restaurant, The Boat Yard, The Treasure Ship, and much more. House is absolutely beautiful. DIRECTLY ON THE BEACH! This amazing 5 bedroom 3 bath home has it all and best of all, on one level so there are no stairs inside. Beachcomber sits directly on the sugary white sand beach of Panama City Beach, Florida. With approximately 2,864 square feet of living, everyone in your group will have plenty of space and be completely comfortable. Enjoy panoramic views of the world’s most beautiful beach from the 1,500 square feet of outside decking complete with a hot tub and a private pool. Two oversized hammocks are hung for total relaxation. The family room is bright and spacious and includes a wall of windows/patio door to the beach where you can enjoy that million dollar view. The dining room is open and spacious and has a dining table seating 8 and an additional 6 can dine at the kitchen bar. A folding table with 4 chairs provides seating for additional guests. The kitchen is open to the dining room and family room and is incredibly well stocked for the gourmet cook. Beachcomber has the best open concept floorplan and even has a Foosball table! Bedroom #1 - Master bedroom enjoys a King bed and a Twin bed with trundle. Bedroom #2 - Twin bunk as well as a custom built Queen over Queen bunk with trundle. Bedroom #3 - King bed. Bedroom #4 - Customer built Queen over Queen bunk with a trundle. Bedroom #5 - Queen bed. All bedrooms have wall-mounted flat screen TVs. Parking is not an issue at Beachcomber. There is plenty of space for parking 5 cars, boats, and motorcycles. You will not find a more comfortable home in Panama City beach with so much space for large groups. Located just west of Schooner’s Beach Bar and Restaurant, Beachcomber is located in a great location so it is very popular and fills up quickly. Book early and make Beachcomber the vacation of a lifetime. This property has 2 Kings, 7 Queens, 4 Twins. Newly Listed Beachfront Home! Sleeps 14 in beds!!! 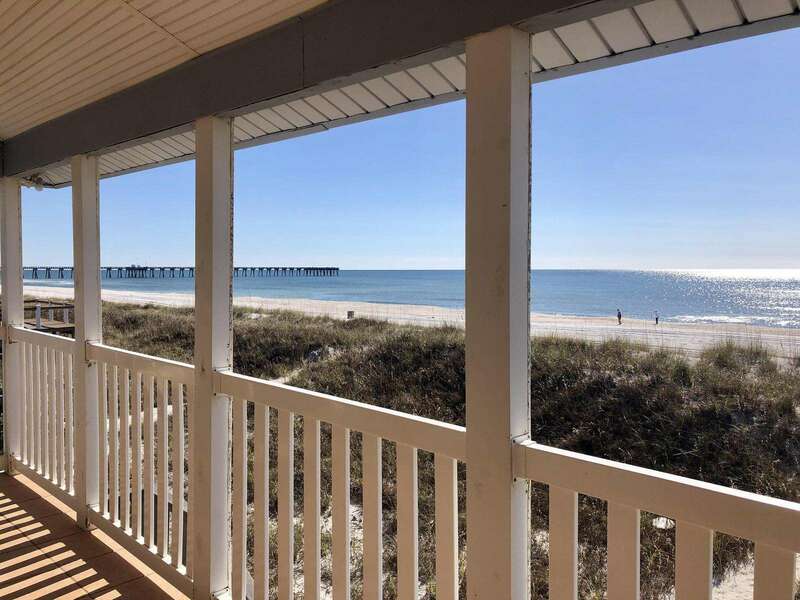 High Tide - Wonderful Beachfront Home with 3 bedrooms (additional kids retreat accessible through master bedroom) 2 bath home that sits directly on the sugary white sand beaches of Panama City Beach. ZERO steps to the Beach - You are already there! High Tide is approximately 2000 square feet with fantastic views of the Emerald water. Home has a large open area for entertaining and a gourmet kitchen. There is also a screened in porch off the master bedroom overlooking the ocean. The house also boasts plenty of outdoor space (covered and uncovered) over-looking the beautiful beach and Gulf of Mexico. High Tide is perfect for enjoying the sound of the waves or cooling off in the Ocean! Excellent layout for large groups! Kitchen is fully furnished with everything you will need. Come make memories and enjoy this wonderful home with your family and friends. Home is located on Spyglass Drive on the East end of Panama City Beach.The home's location couldn't be better; you're walking distance to several restaurants, night spots and a short bike ride to St Andrews State Park. Whether you're watching the sunbathers or the sunsets, you can't beat this view! Three bedrooms on the main floor with queen beds and the upstairs Master bedroom has a king bed... there is a kids retreat off of the upstairs (master) bedroom that has one full, two twins, 1 custom (for a small child) and a 27'X80' banquette.Room sizes with queens are 10X9 and 9X12, Master with King is 16X12, and the bunk area is 13X7. In addition, there will be one queen pullout sleeper sofa bed.. Sand Blast has plenty of space. This 3000 square foot, 4 bedroom, 5 bath home with a bonus room, is located directly on the beautiful beaches of Panama City Beach. Come enjoy stunning views of the Gulf and picture perfect sunsets. The home has travertine floors throughout, new stainless steel appliances, granite counter tops and full amenities in the kitchen. The open floor plan extends from the kitchen into a grand room. The grand room has a table that easily seats 10 for dining. The sitting area has comfortable furnishings for either enjoying the breathtaking views or watching some TV. The bedrooms are decorated with colors inspired by beach living that are not only inviting but relaxing as well. The master bedroom has a king bed with bathroom. 2nd bedroom has a king bed and a twin with bathroom. 3rd bedroom has a king bed with bathroom. 4th bedroom has 3 sets of bunk beds; 2 with twin/twin, the other twin/double with the bathroom across the hall. bonus room has a bunk bed; twin/double with bathroom. Home is approximately 2700 square feet with great views of the GULF from almost every room and flat screens and DVD's in the greatroom and all 4 bedrooms. Home also boasts 2 master suites and a huge great room with plenty of room for great times including Foosball table, Upstairs master suite enjoys its own private balcony - also with awesome Gulf views. Enjoy sunsets from the spacious 53 X 13 ft deck with new private 7 person hot tub, large dining set for 6 and picnic table for the kids! Excellent layout for large groups! Kitchen is fully furnished with everything you will need. Large kitchen table seats 8 for your large groups to dine and 4 more seats at the kitchen bar. Every corner of this beautiful home has been recently renovated. Home also boasts parking for boats, motorcycles, and RV's (up to 6 cars). Come make memories and enjoy this wonderful home with your family or large group. The relaxed life at the beach awaits! Home is located just west of the popular Pier Park. House is absolutely beautiful. Call now to reserve your memory making vacation! Beachfront Home with Private Beachfront Pool! Location, Location, Location! Sleeps 18 in beds!!! 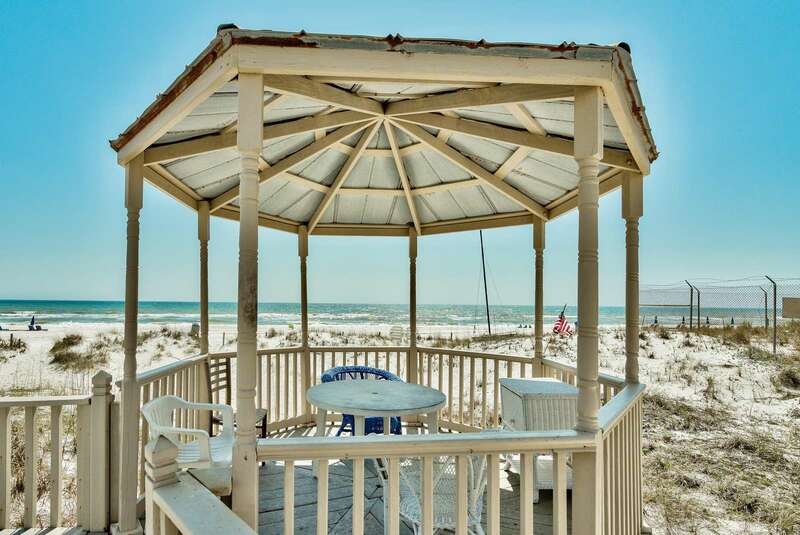 The Pelican's Nest is a beautiful 4 bedroom (Additional sleeping Loft area) 3.5 bath home that sits directly on the sugary white sand beaches of Panama City Beach. ZERO steps to the Beach - You are already there! Home is approximately 2600 square feet with almost every room having a wonderful view of the Emerald water. Home has a Large open area for entertaining and gourmet kitchen. There is also a separate Media/Game room for the kids upstairs with game tables and large flat screen. With over 1800 sq. feet of Outside Decking (with 450 sq feet protected from Sun/Rain), The Pelican's Nest is perfect for enjoying the sound of the waves or cooling off in the Pool! Excellent layout for large groups! Kitchen is fully furnished with everything you will need. Large kitchen table seats 8-10 + 4 more at the standard height kitchen bar (plenty of outside dining as well - 15 more!). Home is located on Surf Drive (West end of Thomas Drive area). Walk across the street to Captain Jack's Crab Leg Buffet or drive just 3 minutes to Schooner's, Montego Bay, Scampi's, and many other restaurants. Home is also just a short 5 minute drive to St. Andrews Bay and the world famous Captain Anderson's Restaurant, and much more. House is absolutely beautiful!!! New Beachfront Home with Private Beachfront Pool! Location, Location, Location! Sleeps 22 in beds!!! 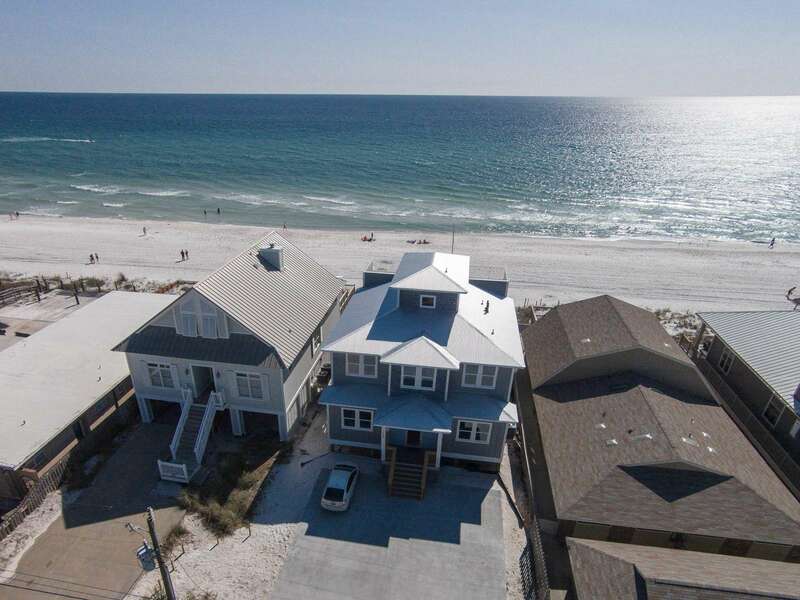 The Lighthouse is a beautiful 5 bedroom (Additional sleeping Loft area) 4.5 bath home that sits directly on the sugary white sand beaches of Panama City Beach. ZERO steps to the Beach - You are already there! Home is approximately 2600 square feet with almost every room having a wonderful view of the Emerald water. Home has a Large open area for entertaining and gourmet kitchen. There is also a separate Media/Game room for the kids upstairs with game tables and large flat screen. With over 1800 sq. feet of Outside Decking (with 450 sq feet protected from Sun/Rain), The Lighthouse is perfect for enjoying the sound of the waves or cooling off in the Pool! Excellent layout for large groups! Kitchen is fully furnished with everything you will need. Large kitchen table seats 8-10 + 4 more at the standard height kitchen bar (plenty of outside dining as well - 15 more!). Come make memories and enjoy this wonderful home with your family. Home is located on Gulf Drive (East end of Thomas Drive area). Walk across the street to Captain Jack's Crab Leg Buffet or drive just 3 minutes to Schooner's, Montego Bay, Scampi's, and many other restaurants. Home is also just a short 5 minute drive to St. Andrews Bay and the world famous Captain Anderson's Restaurant, and much more. House is absolutely beautiful. 'Southern Comfort' is a beautifully finished Florida Cottage style beach house with a private pool. It is located on the east end of Panama City Beach on Thomas Drive directly across from Rick Seltzer beach park. The three spacious bedrooms are located on the first and second floors. The master bedroom is located on the second floor and has a private balcony. Each bedroom has its own private bath. There is a large 3rd floor loft with a half bath, wet bar, TV, Queen size futon bed, and a sundeck with an outdoor dining table & chairs, lounge chairs and breathtaking Gulf views. The kitchen is well-stocked and equipped with custom cabinets, granite counter tops, premium appliances, and all the essentials for lovingly preparing meals for the family. The house is designed to make you feel like you're in the comfort of your own home. For rainy days there are many board and card games for all ages. There are wonderful beach books to read to the youngsters as they nod off to sleep. This is a great home for one large family or two smaller families that care to share the cost of a beach rental. One king room, 1 queen room, 2 sets of bunks, 1 queen futon, and a large loft area. All Groups Must have an Adult Minimum age of 25 and Staying with the Group to Rent this Property! Fun Activities: Shipwreck Island water park is blast for the whole family in the heat of the summer. Within a very short distance of the house there are several venues for miniature golf, bumper boats, sling shot bungee rides, a Ripley's Believe it or Not, and all the beach activities one could ask for. For the golfing enthusiasts, there are 5 public courses within minutes of the house. Signal Hill is just a mile down the road. Holiday Club is about a 12 minute drive and is a little more challenging. For the best golfers, Bay Point, with its 2 courses is about a 10 minute drive, and The Hombre is less than a 10 minute drive. 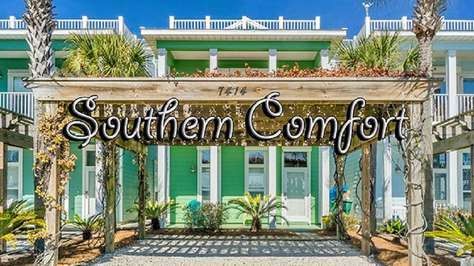 'Southern Comfort' is located in the heart of all your favorite beach activities. This property has 2 King(s), 4 Twin(s), 1 Queen Futon. 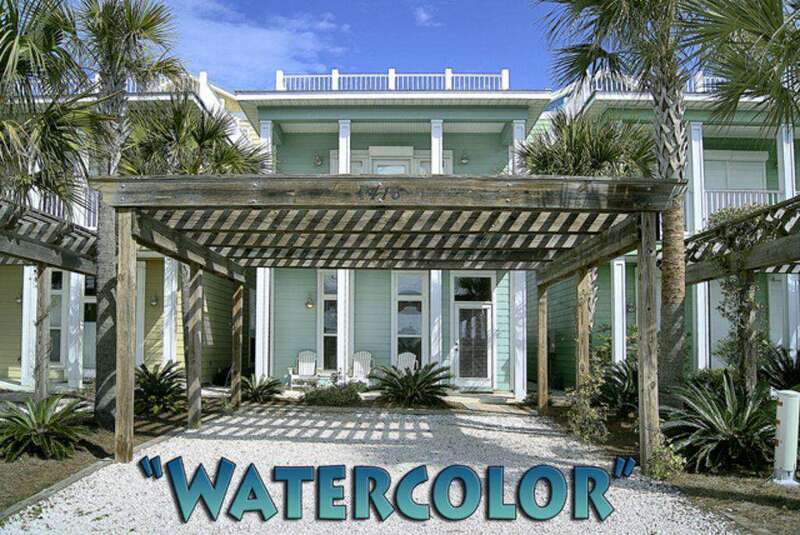 'Watercolor' is a beautifully finished Florida Cottage style beach house with a private pool. It is located on the east end of Panama City Beach on Thomas Drive directly across from Rick Seltzer beach park. The three spacious bedrooms are located on the first and second floors. The master bedroom is located on the second floor and has a private balcony. Each bedroom has its own private bath and premium mattress and linens. There is a large 3rd floor loft with a half bath, wet bar, TV, sleeper sofa, and a sundeck with an outdoor dining table and breathtaking Gulf views. This is a great home for one large family or two smaller families that care to share the cost of a beach rental. One king room, 1 queen room, 2 sets of bunks, 2 sofa sleepers, and a large loft area. If Panama City Beach is your canvas, paint your vacation picture with "Watercolor"! Fun Activities: Shipwreck Island water park is blast for the whole family in the heat of the summer. Within a very short distance of the house there are several venues for miniature golf, bumper boats, sling shot bungee rides, a Ripley's Believe it or Not, and all the beach activities one could ask for. For the golfing enthusiasts, there are 5 public courses within minutes of the house. Signal Hill is just a mile down the road. Holiday Club is about a 12 minute drive and is a little more challenging. For the best golfers, Bay Point, with its 2 courses is about a 10 minute drive, and The Hombre is less than a 10 minute drive. 'Watercolor' is located in the heart of all your favorite beach activities. You can have it all when you stay in an Edgewater Villa. The Golf Villas provide a peaceful setting, perfect for families or retirees, with beautiful landscaping, a family friendly heated pool, a health club with spa (Massage, anyone? ), executive 9 hole golf course and both tennis and basketball courts within a few steps from your door. When you are in the mood for more activity, take a walk or the resort tram across the pedestrian bridge to the lush Lagoon Pool, landscaped with tropical palms and sparkling waterfalls. Two hot tubs are in the pool area, providing a relaxing experience year round. A poolside bar beckons, along with Oceans Restaurant, serving outside (perfect for people watching) or inside in air conditioned comfort. And of course, there is the BEACH - miles of sugar white sand lapped by the most beautiful blue and green water in the world. Enjoy the view from comfortable beach chairs that line the waters edge. Or take the plunge into the waves to swim, snorkle, surf, or just bob in the waves. If you are truly adventurous, you can rent a wave runner or book a parasailing experience from a vendor right on the beach. From any angle, the view is spectacular! When your day in the sun is over, leave the commotion behind and stroll back to the serenity of your townhouse style villa. You can have it all when you stay at Aqua. This 1368 square foot floor plan is the largest 2 bedroom w/ bunk in AQUA. The furnishings and decor are classy and upscale....making this unit a very popular rental. The wrap around balcony offers spectacular views of the Gulf. Truly an outstanding home in one of the best locations on the beach. AQUA has been recognized as the best of the best on Panama City Beach two years in a row. The location, so close to Pier Park, the distinctive architecture, the amenities, high quality construction, all help to create a community that truly stands out on the beach. Renovated. New tile and paint April 2018! Upgrades annually. This beautifully decorated two bedroom, two bath, 5th floor condominium has breathtaking views of the Gulf of Mexico. This corner unit, with wrap around terrace off the living room and master bedroom, overlooks the Gulf with magnificent sunset views. Fully appointed kitchen with stainless steel appliances includes ice maker, microwave, dishwasher and laundry area. Other features include ceiling fans, central heating and air conditioning and a large master bath with whirlpool tub, separate glass enclosed shower, double vanity and lots of closet space.